This small business law firm supports your big picture with valuable counsel. Your legal matters are handled professionally with distinguished skill set. With over 45 years' experience, David expertly anticipates possible outcomes of your case and proposes your best options. There are no junior attorneys, no middle men. Attorney David H. Schwartz works directly with you for quality, expeditious legal solutions serving your business. Business litigation is never simple, and it is never comfortable. It diverts attention from management priorities and growth opportunities, and it poses a significant risk to profitability. Complex disputes involving securities, business torts, trade secrets or other issues can tax your organizations resources to the limit. In addition, onerous civil procedure rules and complex and voluminous discovery requirements can put confidential information at risk of disclosure to competitors. If you are a client of the San Francisco-based Law Offices of David H. Schwartz, you are either suing or need to sue. Your success, upon which the survival of your business may rest, depends upon the broad experience of a focused business litigation attorney. David has successfully navigated cases of trade secrets, disputes, complex business and commercial litigation, Civil RICO, and shareholder derivative actions for California clients. "I've learned to think of legal strategy as a form of war, with feints, advances and retreats. Knowing when to focus on the individual battle and when to focus on overall war guides the path to success." David represents cases involving breach of a provision of a valuable buy/sell agreement, allegations of fraud, or any business law issue. Trial lawyer David H. Schwartz presents answers for the complexities of securities laws, including arbitration, litigation and regulatory matters. Businesses depend on trade secrets. David can implement strategies protecting those key assets or defend an individual accused of stealing trade secrets. Failure to defend a trademark could cost a business in many ways, including integrity of the brand. David can resolve these through assertive negotiation, mediation, and litigation. Our firm employs focused legal strategies supporting businesses through instances of individual and multi-party contract disputes, cross claims, and multiple jurisdictions. We represent businesses and individuals, throughout the Bay Area and California, in matters of insurance disputes, false advertising and other commercial claims. Management styles, personality incompatibility and other ownership disagreements may arise. David’s experience helps resolve these disputes with clients’ objectives in mind. Cases involving business mismanagement face obstacles from the start, and having counsel experienced in overcoming these barriers is essential. Unfair competition action suits are more than just business matters. Criminal charges could accompany these cases. We prepare you for all outcomes through informed strategies. Our services reach beyond the trial court level into appellate court, where we have set authoritative precedents in the Ninth Circuit and California Supreme Court. Civil RICO suits are complex, and they usually involve extensive discovery and case preparation efforts following the filing of the complaint. It is an unfortunate reality that parents or other loved-ones nearing the end of their lives are uniquely vulnerable to persons, whether family members, care-givers, lawyers, or even relative strangers, who prey upon them for their money. Defamation actions require careful planning and preparation, as well as counsel fully conversant with the many pitfalls facing defamation plaintiffs. David takes on the tough business of complex litigation so businesses don’t need to. 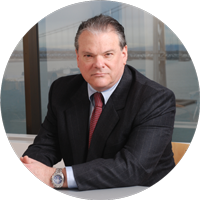 He has successfully served the legal needs of Bay Area and California business and individual clients for more than 45 years remaining professional and sensitive to his clients’ needs. Complex business litigation should be simple for you. David leverages experience behind your case to keep it simple. Whether you live in Alameda County or San Mateo County, he can see how your case will play out through the legal system. He takes a personal, seasoned approach to leave you with no surprises as he explains how the process will work for you. Legal actions can take time and resources some larger firms may not have to devote to your case. Your risk in those situations may be more than you can afford, which those firms relegating your sensitive matters to an inexperienced attorney. Dealing directly with David affords your business protection and practical knowledge that could spare you hours of attention away from your business. David's results-driven approach works to ensure your hard-earned assets survive the uncomfortable legal circumstances all businesses must address. He has successfully represented companies and individuals in multimillion-dollar cases. From Oakland to Santa Clara, clients seek his legal counsel due to his broad experience in business and commercial law. His conduct and strategies have resulted in precedent-setting decisions on the state and federal levels. The long process of dealing with the court system when it comes to your business may sponge your assets dry. A contract dispute or civil litigation on the horizon calls for action. As a business or individual, it's imperative to understand your rights and secure your assets. The cost in hours spent frivolously away from your business in an attempt to understand the depth of your legal circumstances are not worth it. Your next best move is seeking legal advice of the Law Offices of David H. Schwartz.